Callaway GOLF has this week launched its new Speed Regime balls, a family of Tour-level products engineered to golfers’ individual swing speeds to maximise distance and spin. Available in three models – SR1, SR2 and SR3 – Speed Regime balls deliver Tour standard aerodynamics and performance across all three products regardless of Swing Speed, creating optimum spin separation for longer drives without compromising on feel around the greens. To maximise the benefit of Speed Regime technology, Callaway’s R&D team have developed the balls to match three common driver swing speed categories; 90mph and below (SR1), 90-105mph (SR2) and 105mph and above (SR3), allowing golfers to ‘custom fit’ an exact Speed Regime ball to deliver total performance. Given I fit the bill of the SR2, with a current driver swing speed around 97mph, the white sleeve would be my preferred ball of choice to ensure fair testing to match my game. On first look, there's the traditional Callaway HEX dimple pattern. What I love most about this dimple pattern is that it generates a little bit of lift during the final third of the driver's flight. You can really get this thing flying into the sky. In terms of feel, I love the softness of the new proprietary cover, especially around the greens. It feels soft and springy off the tee and nice and buttery from inside 100 yards. It produces a nice 'click' sound when catching it out the centre of the clubface. On the greens, it doesn't quite feel as soft. Given I've only tested Callaway's previous 5-piece Tour ball, the HEX Black, in recent years, that was the only ball I could place it up against when assessing my shot data at Mannings Heath Golf Club recently. In terms of carry distance with the big dog, I was averaging around 226 yards - a five-yard gain on the Callaway HEX Black I hit last year, with the SR2 running out to 267 yards for a nine-yard gain in total yardage. Driver spin was also considerably lower than the HEX Tour at 2,700rpm instead of the 3,000rpm. These improvements are down to a softer inner core in the SR2, as well as a thinner inner and outer mantle. I then took the Trackman monitor outside onto the short game area to measure my wedge data. Carry distance with the 52-degree was pretty much exactly the same at around 100 yard-mark, but pleasingly spin had improved dramatically from 9,000rpm up to 9,400rpm. I felt like I was compressing the ball much better and this is partly down to the firmer outer core. In terms of several mid-iron shots I hit down the ninth hole, I can safely this ball hold its line beautifully in the wind. Perfect for golf at this time of season. Easy to hit low punch shots and the ball was also very keen to work for its draw when I asked it too. 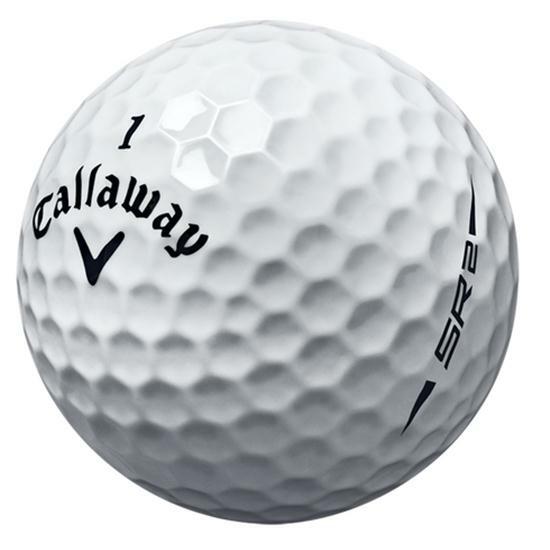 The 5-piece Callaway SR2 ball is an improvement on the HEX Black Tour ball because it has boosted my ball speed and reduced spin off the tee, and is a much better drop-and-stop golf ball. If you've a swing speed between 90 and 105mph, which I imagine is a good few of you out there, and are looking to switch balls this season, you won't go far wrong with the SR2 - a ball that delivers solid distance and exquisite feel with the wedges. Very much ideal for the athletic swingers of the ball. Not the softest ball I've ever putted with before, though. £40 isn't cheap but it's a Tour-level ball that will undoubtedly help lower your scores and get you out there a little longer.